It’s a goal Cat shares and a top priority whenever they bring a new product to market. With the introduction of the Cat® 320GC, 320, 323, 336GC and 336 Excavators, they’ve added new features and technologies to address some of your biggest safety challenges, including fatigue, falls and contact between equipment and people. ISO-Certified ROPS cabs are sound-suppressed, sealed and climate-controlled for a clean, quiet work space. Large front windows and a streamlined front profile increase visibility without the stress and strain of constantly leaning forward. Wide, adjustable seats provide all-day comfort for operators of all sizes. Customisable joysticks let operators match pattern and response to personal preferences. Touchscreen monitors can be reached without twisting and turning. Convenience features like USB ports and Bluetooth-integrated radio make the work environment more pleasant. Investing in equipment with ergonomic features delivers a powerful message about an employer’s commitment to managing fatigue. It can also be an effective way to raise productivity and control costs. Product development teams at Caterpillar strive to incorporate features and technologies into their designs to reduce the risks. New Generation Cat Excavators are designed to help you address your biggest safety challenges: fatigue, falls and contact between people and assets. Talk to your Cat dealer about how these excavators can be used to help you move material safely and efficiently at the lowest total cost. 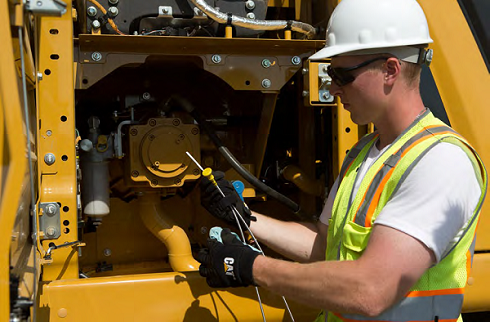 TO PREVENT FALLS, Cat made every daily maintenance checkpoint accessible from the ground. No climbing is required to check the engine oil and coolant level, inspect the fuel water separator or empty the fuel tank drains. Dozens of other maintenance procedures can also be done from the ground. TO AVOID COLLISIONS, ELECTROCUTION AND INTERFERENCE WITH OTHER OBJECTS, Cat made E-fence technology standard on the Cat 320 and 323. It allows the operator to set up to five electronic boundaries around a machine. E-WALL SWING – Prevents a machine from swinging into side obstacles such as traffic or other equipment. E-WALL FORWARD – Stops the excavator from running into obstacles in front of the machine. E-WALL CAB – Prohibits contact between the cab and a work tool. E-WALL CEILING – Keeps the boom and stick from contacting overhead obstacles such as power lines. E-WALL FLOOR – Sets an automatic depth boundary, so cables, utilities and other underground hazards can be avoided. Show this article at the Caterpillar stand (K20) at NCEC (15-17 November at Sydney Olympic Park) to redeem free CAT merchandise. Limited to first 100 redemption’s daily.